About a week ago, while I was still rushing through beautiful New Zealand, this BBC interview with Economics Professor Steve Keen emerged and quickly got shared by predominantly leftist people. Keen, recently accepted a position at Kingston University, had his call to fame by predicting the financial crisis in 2008, an achievement shared by largely peripheral economists. In the interview, Keen points out what he's been repeating for decades that banking systems matter, that they create money and that this money influences the economy. This is a prime example of where the peripheral schools of thought in Economics teaching broadly agrees with one another against the dominant mainstream view, albeit with vastly different implications and details of that perspective. "in global terms, you've got highest level of debt compared to GDP in the history of humanity." Because he believes debt is so dangerous, his generic solution is a QE for the people, essentially debt-relief by vastly expanding the money supply. While I agree with his intention to equalise the treatments of Main Street with Wall Street, this solution is outright stupid. Let's take a look at why. The most obvious mistake, which economists and journalists often make in regards to housing prices, is conflating stock and flow. GDP is a flow, created in each period by investments, business and individuals acting and consuming. Debt is stock, a financial contract of payment between two parties, quite unrelated to GDP. As such, comparisons to GDP become quite nonsensical. Debts correspond to assets, because that's what they intend to finance or create; in other words, having massive debts is not an issue as long as there is assets to back them up - think Oil Tankers or Airlines, with incredibly large asset-purchases to finance, with equally large debts. Of course, there is a relationship between assets/debts and incomes that is a flow: interest rates. But unless professor Keen somehow failed to notice, debt is cheap these days thanks to imprudent central banks, interest rates being artificially low (lowest in "history of humanity"? ), and so financing the same amount of assets is much cheaper - or equivalently, the same amount used to finance debt in the past can now finance so much more debt, without jeopardising the ability to carry that debt. Hence, prima facie we should expect debts to be much higher than before. Or, at least it suggest that perhaps private debt is no cause for anxiety, as opposed to the almost doubling of public debt as share of GDP over the last 15 years. Moving on to Keen's suggestion of QE for the people. As we've seen, high private debt-to-GDP is a red herring and not a problem. But for the sake of argument let's ignore that and see what follows from his solution. First of all, by massively expanding the money supply, Keen circumvents the sole reason the Fed's trillion-increases in Base Money has not yielded the widespread inflation many Economists warned about: that banks are simply sitting on the money or parking it at the Federal Reserve earning interest rather than making loans. The money is not in the real economy, pushing up prices the way Austrians feared, nor bumping spending the way new-keynesians such as Bernanke or Krugman hoped for. Aggressively circumventing this, as Keen suggests, would release both those forced very quickly; GDP figures and employment would ramp up, prices for already-scarce resources would jack up, capital goods would pretty instantly become more expensive and the lovely inflation would return. Probably, depending on the size of the QE, it might be the out-of-control version we've been afraid of. But why would that matter, Professor? Secondly, since the reason people held so much debt in the first place (low interest rate-policy and propped-up housing markets) are not dealt with, it's likely that people take on new debt once the old one is paid off by this Keen injection (or made redundant by price inflation lowering the real burden of debt). After all, houses are still expensive and debt is still cheap. When these people take on new debt, we rode a very bumpy and expensive merry-go-round, only to return to where we started, Professor - oh, expect for the fact that you sincerely screwed up monetary systems and incentives along the ride. Thirdly, incentives. What happens to the mindset, the risk aversion and idea of debt when Keen gives everyone a massive debt relief? If someone else pays for my debt when they become too high, what will I likely do in the future? Essentially, in his quest for cosmic justice Keen extends the damaging problems of moral hazard in the banking system to every system, increasing risks all around, likely ramping up even more debt later on, since it is now rational to assume that parts of it won't be mine to repay. Lastly, it's ironic how Keen criticize mainstream economists like former fed chairman Bernanke, when Keen's own "solution" is copying good old Helicopter Ben's hypothetical solutions from way before the crisis. It was ludicrous then, it's ludicrous now. I'm glad such a public figure as Steve Keen speaks up about the monetary system and creates some diversity in an otherwise pretty homogeneous(ly wrong) discipline. And I'm incredibly happy that he's speaking at Glasgow Economic Forum in March (You should all go, btw!). But boy are his ideas wrong. Spectacularly incorrect, hysterically unsuitable and outright dangerous. Not that it ever stopped statists before, did it. Three points. Firstly debt may well be a stock but debt repayments are a flow. And the more debt, the more debt repayments. Secondly the issue with debt is that it has to be repaid with money. It's all very well saying that debts match assets, so everything is great, but the trouble is that when it is time to pay your lender you need to pay with cash, not with some portion of the asset. If you have to sell the asset in order to get money to pay the loan, you have a problem. If you discover that you can't get enough money to make the repayment by using the asset to earn an income, or even by selling it, you have a big problem. So the flow of money in circulation has to be large enough to at least match the flow of debt repayments, no matter how well the stock of assets might match the stock of debt. Thirdly, Steve Keen's proposal is not a helicopter money proposal; it is a debt reduction proposal. Helicopter money can be spent by its recipients on anything from rent, to consumer goods, to interest payments, to debt reduction. As such it would very likely have the results you predict. In contrast Keen's proposal prioritises debt principal repayment with the aim of reducing future debt repayments. As a result it would not inject money into circulation to nearly the same extent as the standard helicopter money would do. Thanks for stopping by, guys. 1)/2): Ok, fair enough, this Minskyate 'speculative' debt levels where cash flow is barely sufficient to pay interest, and so repayments become an impossibility is a valid point. Now, consider this; in an economy where central banks do everything in their power to constantly push down yields and interest rates (ie, companies can constantly refinance at lower rates), instead of pursuing lower interest rates, they could agree on longer maturity. And so any business with a functioning calculator could figure out a sustainable combination of interest & debt repayments. 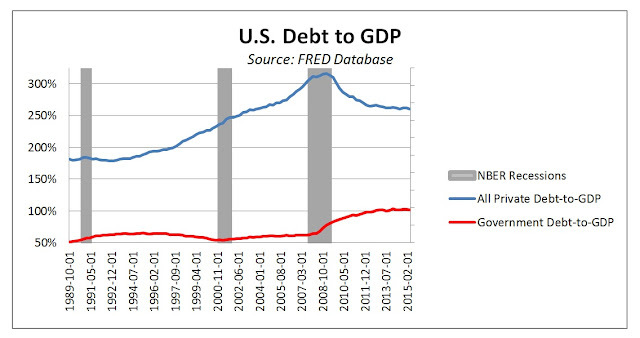 My point still stands; looking at debt charts and crying "wolf" is quite silly. Secondly, it matters what this increase in debts you're so afraid of is doing. If it's taken out and consumed by households like pre-crisis Home ATM strategies, I agree we're in big trouble. If it's invested in factories, business expenditure, successful start-ups etc (and shale gas boom of few years back seem to suggest it was..) debt is mostly harmless. 3) ok, maybe I exaggerate the Helicopter Ben analogy, but his suggestion still puts you guys in a very awkward situation: either it runs into incentive/moral hazard problems where people simply jack up their debt levels as soon as the reduction has kicked in - or the deflation of credit and de facto contraction of money supply sends prices falling. And so we see widespread deflation. Not that I mind, but last time I checked, Keen's camp of economists normally wants to jack CPI inflation UP - not down. With Helicopter Money, jacking up debt levels is perfectly possible, so your point about the moral hazard of jacking up level of debt is perfectly good. But with Keen's proposal it's not, because anyone with debt must first use the money to pay down principal under the terms of his scheme. Sure, anyone who doesn't have debt could use the money to jack up debt. But if they wanted to do that they would have done it already. That kind of person is more likely to invest the cash. So moral hazard isn't an issue for Keen's proposal. First of, you're missing the point. Afaik, Keen's proposal doesn't including a permanent ban on certain debt levels, right. Meaning that when Average Joe with credit cards debts or massively leveraged Business B get this Keen money, it is true that they are forced the pay down debt; what I'm saying is that AFTER that, they have every incentive to take out new debt. Why? They took on these debts for a reason (stupidity, imprudency, low interest rates, propped housing market whathave you), and Keen's proposal is not targetting those. That is, even if what you're saying is true, it's only painkillers for a cancer patient. Ok, maybe. Problem is: by intervening in markets via QE stimulus, the losses from the housing market crash are kept aside. Since -09 the Fed has effectively bought up toxic assets rather then let them default so the economy can recover. Instead, we're stuck in this never-ending circle of slow-growth and only slowly over time take those losses. What we need IS a negative balance between debt creation and repayment. New debt just prolongs the crisis.. Shoving dirt under the rug doesn't make it go away.. Here we go again with the "omg deflation is horrible". Funny how generally left-wing economist rely so much on Friedman & Schwartz...There's no compelling reason why generally falling CPI numbers should be a cause for concern. As Derek points out, the logical fact that the total of debts equals the total of assets buys you absolutely nothing, either literally or theoretically. If it had any purchase in the real world there would, for example, be no credit-checking industry. It is a sign of the dogmatism of mainstream economics and its fantasy barter world that the difference between claims to wealth and real wealth is not recognised. It is now well over 100 years since Marx introduced the concept of fictitious capital -- "money that is thrown into circulation as capital without any material basis in commodities or productive activity" -- or in other words paper claims to wealth and income streams, as distinct from from money capital on the one hand, and real capital invested in productive assets on the other. See my response above; it does. That's a non sequitur; and that industry does exactly what I was talking about - measure ASSETS on the one hand vs DEBTS on the other. Outcome and riskiness of Same loan with same interest is very different if posting 0 collateral or LARGE collateral. Hm, I like to think that my understanding of HET and diversity of economic ideas is slightly more sophisticated than your average mainstream professor. Besides, there's a difference between knowing your HET (which I claim I do) and accepting validity of former economists claims, in present as well as past life (which I don't). This is Prof R. Werner's suggestion. "Importantly for our disaggregated quantity equation, credit creation can be disaggregated, as we can obtain and analyse information about who obtains loans and what use they are put to. Sectoral loan data provide us with information about the direction of purchasing power - something deposit aggregates cannot tell us. By institutional analysis and the use of such disaggregated credit data it can be determined, at least approximately, what share of purchasing power is primarily spent on `real' transactions that are part of GDP and which part is primarily used for financial transactions. Further, transactions contributing to GDP can be divided into `productive' ones that have a lower risk, as they generate income streams to service them (they can thus be referred to as sustainable or productive), and those that do not increase productivity or the stock of goods and services. Data availability is dependant on central bank publication of such data. The identification of transactions that are part of GDP and those that are not is more straight-forward, simply following the NIA rules." My name is Mrs Sharon Sim. I live in Singapore and i am a happy woman today? and i told my self that any lender that rescue my family from our poor situation, i will refer any person that is looking for loan to him, he gave me happiness to me and my family, i was in need of a loan of S$250,000.00 to start my life all over as i am a single mother with 3 kids I met this honest and GOD fearing man loan lender that help me with a loan of S$250,000.00 SG. Dollar, he is a GOD fearing man, if you are in need of loan and you will pay back the loan please contact him tell him that is Mrs Sharon, that refer you to him. contact Dr Purva Pius,via email:(abubakarloanservice@gmail.com) Thank you. Contact us for a loan with the details below. Do you need long or short term first class financial offer of different categories such as business, personal, home, auto, student, debt consolidation finance e.t.c. no matter your credit score. We are guaranteed in giving out financial services to our numerous clients all over world. With our flexible lending packages, funds can be processed and transferred to the borrower within the shortest time possible, contact our specialist for advice and finance planning through the e-mail: trivagofinancialhome.in@gmail.com call/WhatsApp us +1 (315) 615-2883 for more info. URGENT LOAN AT 3% RATE. LOAN IS APPROVED WITHIN 2 HOURS. APPLY NOW. Feel free to visit us on Email: trivagofinancialhome.in@gmail.com call/WhatsApp us +1(315) 285-7649 website https://trivagofinance.wixsite.com/home for easy application. Once we are in receipt of this information,You will be sent the company loan terms and condition immediately.Be assured that your loan application will be handled with privacy and in a professional manner and you will receive a prompt answer to your request. Email: trivagofinancialhome.in@gmail.com call/WhatsApp us +1(315) 285-7649 website https://trivagofinance.wixsite.com/home for easy application. นนี้เป็นวันที่ดีที่คุณ Sunit Kaensaree ฉันมาจากประเทศไทยในเชียงใหม่ มีความสุขมากที่ได้เขียนคำเบิกความว่าฉันได้รับเงินกู้จากคุณซูซานเจมส์ฉันเชื่อว่าพระเจ้าทรงมีแผนสำหรับฉันหลังจากที่ฉันถูกหลอกลวงด้วยเงินจำนวนมากจากผู้ให้กู้ยืมเงินฉันถูกหลอกและแทบจะคิดว่าจะต้องใช้เวลา ชีวิตของฉัน แต่พระเจ้ามีจุดมุ่งหมายสำหรับฉันถ้าคุณต้องการที่จะได้รับเงินกู้จาก บริษัท ใด ๆ ที่คุณต้องเลือก Susan บริษัท เงินกู้เจมส์เมื่อฉันเป็นครั้งแรกเริ่มต้นกับเธอคิดว่าเธอเป็นเหมือนส่วนที่เหลือและที่ยิ่งใหญ่ที่สุดของฉัน ฉันประหลาดใจที่ได้เงินกู้ 8,000.00 บาทในบัญชีของฉันและนั่นคือจำนวนเงินที่ฉันใช้ใน บริษัท ของเธอและคุณรู้สึกว่าไม่มีความหวังสำหรับคุณ? เป็นเรื่องโกหกเพราะถ้าคุณสนใจที่จะรับเงินกู้ประเภทใดคุณสามารถติดต่อทางอีเมลล์อีเมลของเธอคือ:sanjamesloanfirml07@outlook.com หรือหรือ susanjamesloanfirml07@gmail.com หรือหรือ Whats-app หมายเลขของเธอ:+1(587)206-1157 หรือทางเว็บไซต์:https://susanjamesloanfirm.wixsite.com/loan-officer พระเจ้าอวยพรคุณเช่นเธอ blessed ฉันกับคุณ Susan James โดยรับเงินกู้ของฉันหลังจากที่ถูกตกอยู่ในมือของ scams. Apply for a quick and affordable loan with LOAN Finance Company. My name is Mrs Sharon Sim. I live in Singapore and i am a happy woman today? and i told my self that any lender that rescue my family from our poor situation, i will refer any person that is looking for loan to him, he gave me happiness to me and my family, i was in need of a loan of S$250,000.00 to start my life all over as i am a single mother with 3 kids I met this honest and GOD fearing man loan lender that help me with a loan of S$250,000.00 SG. Dollar, he is a GOD fearing man, if you are in need of loan and you will pay back the loan please contact him tell him that is Mrs Sharon, that refer you to him. contact Dr Purva Pius,via email:(urgentloan22@gmail.com) contact call/whatsapp +918929509036 Thank you. URGENT RELIABLE AND CHEAP INTEREST RATE LOAN OFFER APPLY NOW. for serious minded and God fearing People. URGENT GENUINE LOAN OFFER APPLY NOW. (margaretloans10@gmail.com) and get your loan today. Global Finance Group is a global lending organization dedicated to providing fast secured and unsecured cash loans to qualified individuals and companies at a subsidized interest rate. We have helped numerous number of individuals and organizations who have been facing financial difficulty all over the world. When you apply with us, you’re applying with a trusted company that cares about your financing needs. We’ll take care of you through the whole process. We offer loans from a minimum range of $1,000 to a maximum of $10 million and a loan duration of 1 to 30 years to pay back the loan (secure and unsecured). Our aim is to provide Excellent Professional Financial Services. HELLO FRIENDS FRIENDS. I HERE TO SHARE THIS GOOD NEWS WITH YOU. IN FACT, AFTER MUCH LOOKING FOR A LOAN WITHOUT SATISFACTION, I SAW A COMMENT BY MRS. CHANTALE GISELE WHO GRANTED A LOAN HAS A KNIGHT WHO HAD TO SPEAK ABOUT IT. SO I ALSO CONTACT THIS LADY AND SHE REALLY WAS A LOAN OF USD 95000. THANKS TO MRS. CHANTALE GISELE I COULD EXPAND MY BUSINESS. I NEVER STOP GRATEFULLY. DO NOT HESITATE IN YOU DO NOT HAVE TO CONTACT WITH THEM IN CASE OF NEED. we meet the needs of individuals, companies and organizations. offering private loans without the need of collateral. amount ranging from 10,000 eur up to 5,000,000 eur at 3% interest per annum. Pinnacle Finance Group is a global lending organization dedicated to providing fast secured and unsecured cash loans to individuals and companies at a subsidized interest rate of 3%. We have helped numerous number of individuals and organizations who have been facing financial difficulty all over the world. When you apply with us, you’re applying with a trusted company that cares about your financing needs. We’ll take care of you through the whole process. Do not keep your financial problems to yourself in order for you not to be debt master or financial stress up, which is why you must contact us quickly for a solution to your financial problems. It will be a great joy to us when you are financially stable. We are a financial consultants that handles international finances for any amount of banking instruments. What about finding a reputable Debt Consolidation firm that can assist you in reducing monthly installment so that you will have affordable repayment options as well as room to breathe when it comes to the end of the month and bills need to get paid? Dr. Chris Gethard Loan Phone is the answer. Reduce your payments to ease the strain on your monthly expenses. Email(chrisgethardloan@gmail.com) Phone: call/text +1 (213) 788-6641. Feel free to engage our leased facilities as We have provided over $2 Billion in business loans to over 25,000 business owners just like you. We use our own designated risk technology to provide you with the right business loan so you can grow your business. Our services are fast and reliable, loans are approved within 24 hours of successful application. If you have been finding it so difficult to get equity loan from your local banks or other financial institutes, worry no more, because We have helped numerous number of individuals and organizations who have been facing financial difficulty all over the world. When you apply with SFGI, you’re applying with a trusted company that cares about your financing needs. You’ll be taken care of through the whole process. We got your email and the content was well noted. This access code is needed because this is an international transfer and it requires this code to Enable the transfer go Through successfuly.You need to obtain this code from our bank and this code is going to cost you the sum of $7000usd and soon as you are able to remit the payment we are going to send you the code immediately to enable you finish you transfer. i will be waiting for your urgent response soonest . LOAN OFFER AT LOW RATE...APPLY NOW. Are you looking for a loan to fulfill your wishes?business loan offer or other loan offers,we are here to give you a loan offer at a very low rate with an understandable loan terms and condition.We loan amount (from 5,000 to 10million Dollars. Please get back to us if you are interested in the getting a loan from our company. unsecured funds, risk capital, etc ... You are in the right place Contact us now for more information.